Changed privileges, changed compatibility to Windows 7, won’t install as Administrator,won’t even save the download in my Download Folder…help! 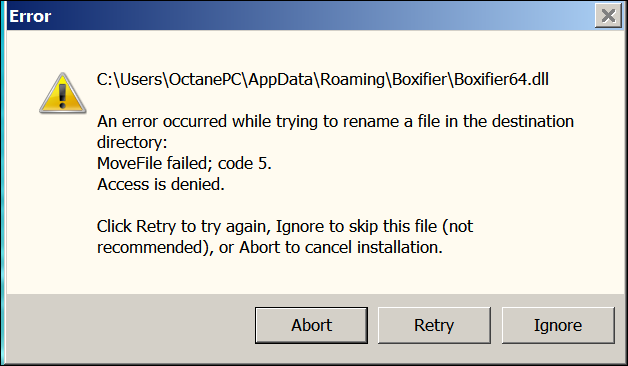 First of all, please don’t run Boxifier application or the installer with compatbility settings on. You don’t need to turn compatibility settings because Boxifier is compatible with every version of Windows released in the past 10 years. The error message you receive most likely indicates that some anti-ransomware software has configured Software Restriction Policies in order to prevent files from being written in your APPDATA folder. Try running the installer once again and let me know if you experience the same error.